Taormina is like a treasure chest of history: walking along its main street, Corso Umberto, and the maze of narrow staircased streets and small beautiful squares, you find Theatres and Gymnasium from the Greek Age, Odeon and Baths from the Roman Age, beautiful buildings in which the Arab and the Norman cultures melt together in a memorable sense of beauty. 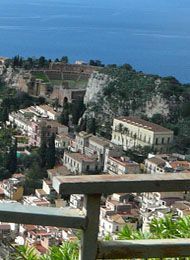 Taormina plays a fundamental role as one of the most important archaeological locations in Italy. In fact, the Greeks, fathers of Italian and European culture, settled their first colony in Italy exactly here in the Bay of Naxos, in 735 BC. 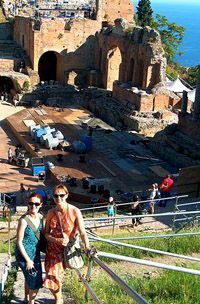 Taormina is home to one of the most famous Greek Theatres in the world. 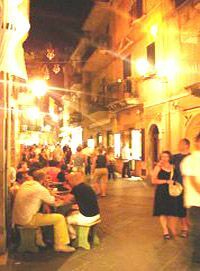 Here, in summertime the main events of the International Film, Music, Dance and Theatre Festival of Taormina Arte take place. Beaches are easy to reach from Taormina, a cable-car connects Taormina to the beaches. Isola Bella, the Bay of Mazzarrò, the Bay of Giardini Naxos, the Beach of Spisone, those are among the most famous beaches in Italy. Our Italian immersion vacation allows you plenty of time to discover the Culture and sights of Sicily. 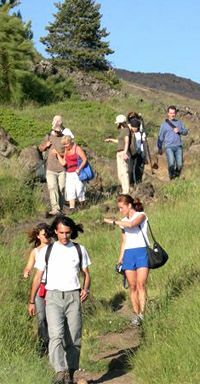 Learn Italian on the island of Sicily,enjoy a truely Italian immersion in a small picturesque town overlooking the Mediterranean, with views to Mount Etna. :: You will make your own travel arrangements. :: Arrive independently into Taormina. :: Language courses start on Monday, finish Friday. :: Your departure day is Saturday. :: You will be studying and living with like-minded adult International students. Situated in the heart of Taormina, housed in a typical style four-storey building, which offers amazing views of the Bay of Naxos and Mount Etna. It also overlooks the community tennis courts, lush public gardens and the Ionian Sea. Students enjoy a relaxed family atmosphere with professional teachers. School accredited by the University for foreigners of Perugia as an Authorized Exam Center (exams are held in June and December) and accredited by the University "Ca' Foscari" of Venice as a recognized teacher training center for decreeing teachers of Italian as Foreign Language at "Ca' Foscari" University. :: Expect to share with other international students. Please note: Double rooms available if travelling together, please inquire. Enjoy social & cultural outings during the week with other students from the school: weekly seminars covering a variety of subjects from Italian literature and poetry to Sicilian-specific subjects including history, politics, cuisine, etc. Excursions could include: Battistero di S.Giovanni, Museo Bologna Buonsignori, Museo dell'Opera Metropolitana, Palazzo Chigi Saracini, Torre del Mangia, weekly street market, Tour of Siena on Horseback, trekking in Siena, walking to explore art and scenery. BOOK THIS LANGUAGE VACATION ONLINE! If you prefer NOT to book & pay online, please click on the link in the above "Start dates & program prices" section, you can book manually this way by filling and submitting the form below the pricing section. 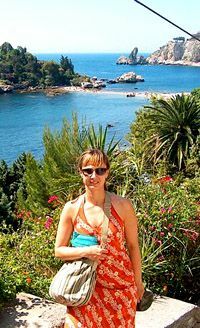 We require a deposit of $300 (or 10% if over $3000) to book any language vacation. The nearest airport is Catania, “Fontanarossa” (about 45 km from Taormina). There are weekly scheduled flights from many European cities and several daily flight connections from Rome, Milan, Napes and Bologna. From the airport to Taormina, there are several public buses that leave every hour and the trip takes about 90 minutes. The school also offers an airport pick up if booked in advance. 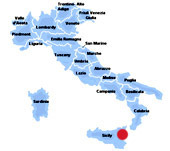 There are also direct train services from many main towns of Italy. The station for Taormina is Giardini-Naxos, directly on the coast. 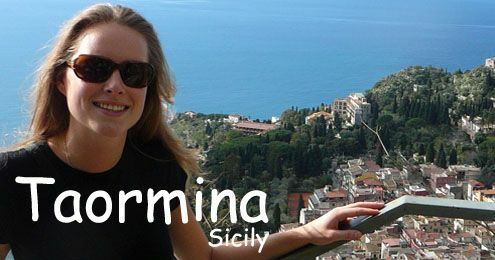 Taormina is a 10 minute drive from the station by local bus or taxi.